Wadsworth, G. M., Parikh, R. Y. and Kim, H. D. (2018). Single-probe RNA FISH in Yeast. Bio-protocol 8(11): e2868. DOI: 10.21769/BioProtoc.2868. Quantitative profiling of mRNA expression is an important part of understanding the state of a cell. The technique of RNA Fluorescence In Situ Hybridization (FISH) involves targeting an RNA transcript with a set of 40 complementary fluorescently labeled DNA oligonucleotide probes. However, there are many circumstances such as transcripts shorter than 200 nt, splicing variations, or alternate initiation sites that create transcripts that would be indistinguishable to a set of multiple probes. To this end we adapted the standard FISH protocol to allow the use of a single probe with a single fluorophore to quantify the amount of transcripts inside budding yeast cells. In addition to allowing the quantification of short transcripts or short features of transcripts, this technique reduces the cost of performing FISH. Precise quantification of the transcript profile of single cells is possible by single molecule Fluorescence In Situ Hybridization (smFISH). 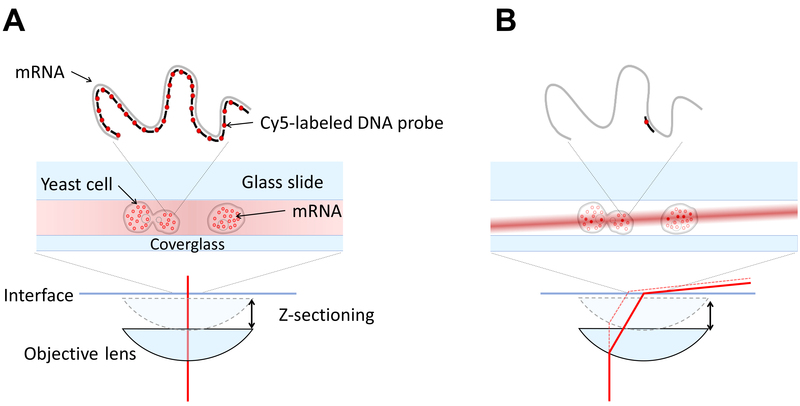 This procedure gives good signal to noise by targeting a single mRNA molecule with multiple fluorescently labeled DNA oligo probes (Raj and Tyagi, 2010). Using this scheme, mRNA of length shorter than 200 nucleotides cannot be detected. However, in most experiments, the absolute transcript copy number is less informative than the relative copy number. To detect short transcripts or sequences, a short single DNA oligo probe can be used. The detection efficiency of a single probe is greater than 50 percent when using a single fluorophore to count mRNA (Wadsworth et al., 2017). Note: This product has been superseded by part number PAF2P-11A . DNA oligo probes are designed by selecting an 18-30 nucleotide region in the target mRNA using four criteria. The choice of probe length should be determined by the RNA-DNA melting temperature of the sequence, which can be done by using the calculator provided on the Integrated DNA Technologies, Inc (IDT) website. The probe should have minimal secondary structure. The target sequence should have minimal secondary structure. The secondary structure can be calculated for the RNA by using the Mfold website (Zuker, 2003). A proper choice has the 5’ end of the probe binding inside a loop rather than a stem in the secondary structure of the mRNA. The probe should be checked for homology with other sequences in the genome using BLAST (Basic Local Alignment Search Tool) (Johnson et al., 2008). Choice of fluorophore is dictated by the illumination scheme. Best results were obtained using Cy3 and Cy5 dyes labeled internally (available through IDT). Other labeling schemes such as end labeling work adequately, but are less photostable. In budding yeast, cellular auto-fluorescence is high in the same region of the emission spectrum as dyes excited by 470 nm or 488 nm light (Atto-488 and Alexa 488) and these dyes are not recommended. When labeled internally the fluorophore should be positioned 2 nt away from either end. Our microscope is a custom-built microscope configured in highly inclined illumination geometry (HILO). For single fluorophores, epi-fluorescence will not generate an adequate signal, Figure 1. It is necessary to have a variable angle geometry on the illumination (most TIR/HILO microscopes have this.) This can be achieved by using a fiber coupled laser or coupling a free space laser to a fiber using a fiberport and a fiber optic cable and moving the fiber output with an x-y translation mount (see Figure 2). 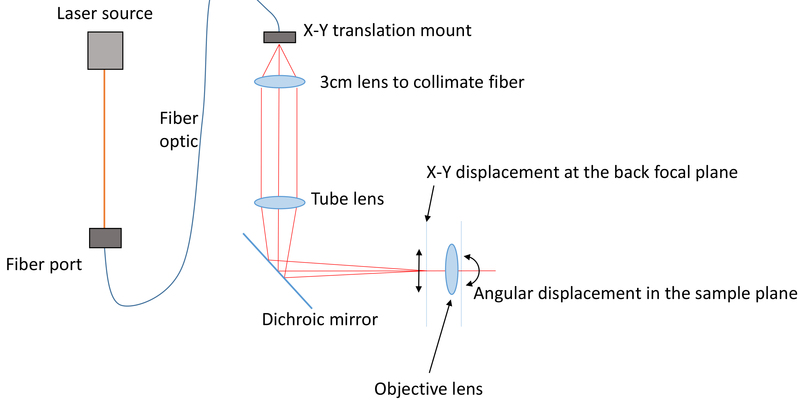 Using the x-y translation, the beam can be adjusted away from the center of the back focal plane of the objective. Once this beam is displaced to the critical angle, total internal reflection geometry is achieved. The angle for inclined illumination is less than the critical angle and should be selected for optimum z-sectioning and intensity in the volume of interest. Figure 1. Comparing Epi and HILO illumination. A. An epi-fluorescence microscope has the illumination incident (red line) on the sample through the objective and the entire volume of the sample is illuminated. This leads to poor signal to noise for single fluorophores since the widefield microscope collects out of focus light. B. An inclined illumination geometry has the illumination (red line) displaced radially in the back focal plane of the objective so that the light becomes a thin laminated sheet in the sample volume (Tokunaga et al., 2008). This enables z-sectioning and increases signal to noise significantly. Figure 2. Schematic of the illumination path. One or more lasers are coupled into a fiber optic cable using a fiberport. This fiber is fitted onto an X-Y translation mount and collimated by a short lens (focal length chosen by the field of view). The tube lens focuses the illumination on the back focal plane. When the X-Y position is adjusted away from the center of the back focal plane the beam becomes inclined through the sample volume. At the end of the day, inoculate yeast cells into 50 ml of liquid media in a culture flask from cells actively growing on a plate. Measure Cell OD using a spectrophotometer at OD600 by placing 1 ml of cell culture in a cuvet. Once cell OD600 has reached 0.6, decant cells into a 50 ml Falcon tube and pelleted by centrifuging at 671 x g for 5 min and aspirated. Cells are pelleted and resuspended in ice cold Buffer B twice and aspirated. Resuspend the cells in 1 ml of Spheroplasting buffer and transfer to a 1.75 ml microcentrifuge tube and add 2 µl of 5 units/µl of zymolyase and gently pipette to mix. Resuspend the cells in 1 ml of 70% ethanol and keep at 4 °C for a minimum of 1 h to overnight. Pellet cells at 268 x g and wash twice each with 1 ml Wash Buffer and aspirate. Note: Wash buffer should be prepared fresh and formamide should be warmed to room temperature before opening. Prepare a mixture of hybridization buffer and probes based on the working concentration determined by titration (see Notes). Then wrap samples with aluminum foil and place in the incubator at 30 °C overnight. Prepare Imaging Buffer immediately before use. Place the coverslip on a slide and seal with epoxy along the edges. Using a microscope as described above, hardware control and the acquisition parameters can be set in the Micromanager software (Edelstein et al., 2014). Z-stack images can be acquired using the multi-dimensional tool in Micromanager for each channel of interest (e.g., DIC, Cy5, etc.). Acquire images at full region of interest (512 x 512) on an EMCCD (iXonEM +, Andor) at 100 msec exposure times. The pixel size and z-step are chosen to be less than or equal to the Nyquist sampling limit for the shortest wavelength (see Introduction to Fourier Optics 3rd edition, Goodman.). The Nyquist limit for a widefield microscope is shown by the following equations where the wavelength λemission used is the peak emission of the fluorophore chosen, the angle θ is the half-aperture angle, and n is the index of refraction of the immersion oil. These values allow the maximum amount of spatial information to be recorded. Sampling above this limit is acceptable although the resolution between two objects will not be improved. Undersampling will lead to the inability to distinguish between two close fluorophores because the information in one pixel is not coupled to the information in its neighboring pixels. Set the laser to output 25 mW at the sample plane. For each chamber, the thickness is approximately 2 µm and an appropriate number of z-slices are acquired. An example of the contrast between a negative control and a low copy number strain is shown in Figure 3. Figure 3. Contrast between strains. A. One z-slice of a negative control for yEvenus mRNA (e.g., wildtype) is shown. All intensity is due to auto-fluorescence. The yEvenus probes are 26nt in length and labeled internally (sequence in Wadsworth, et al., 2017). B. One z-slice of a strain expressing a low copy number (< 20) of yEvenus mRNA transcripts per cell is shown. mRNA transcripts are targeted with a single Cy5 labeled DNA oligo probe. Connect detected edges using 1 x 4 and 4 x 1 structural elements. Label the detected regions in the binary image using the bwlabeln () function. Count the spots detected in each cell by using logical indexing of the segmented cells on an 3D array where the detected centers are marked as 1 and all other locations are 0. With the Andor EMCCD camera (EM stands for electron multiplying), we can observe single fluorophores in either a HILO or total internal reflection geometry with nominal gain that is between 50-500 depending on the fluorophore. With our illumination setup, we find no reason to expose for longer than 100 msec although exposures of 1 sec to 2 sec are common in literature. While overnight treatment with ethanol is acceptable, we find the most consistent results when cells are hybridized after 1 h of ethanol treatment. Create serial dilutions of probes in hybridization buffer from 1 nM to 100 nM or a range where the detected number of FISH spots in the sample plateaus. This concentration is chosen as the working concentration of probes. 65 nM working concentration probes seems to be appropriate for probes of 60 °C RNA-DNA melting temperature in the range of 18-26 nt. We avoid using nail polish although it is common, because it contains solvents that will wick into the sample and cause photobleaching or auto-fluorescence. We find epoxy does not have that effect. We use a 1.4 NA 100x objective with additional magnification to oversample based on the Nyquist criterion. The camera is set to Frame Transfer mode. The hardware binning is set to 1 x 1. The gain is set to a level that confines the intensity to the dynamic range of the camera on the brightest sample (200 for Cy5). Q: The concentration at the end of reagent. This protocol has been adapted from Raj et al. (2010). This work was supported by Georgia Institute of Technology startup funds, GAANN Molecular Biophysics and Biotechnology Fellowship, and the National Institutes of Health grant (R01-GM112882). The authors declare no conflicts of interests or competing interests. Johnson, M., Zaretskaya, I., Raytselis, Y., Merezhuk, Y., McGinnis, S. and Madden, T. L. (2008). NCBI BLAST: a better web interface. Nucleic Acids Res 36(Web Server issue): W5-9. How to cite: Wadsworth, G. M., Parikh, R. Y. and Kim, H. D. (2018). Single-probe RNA FISH in Yeast. Bio-protocol 8(11): e2868. DOI: 10.21769/BioProtoc.2868.